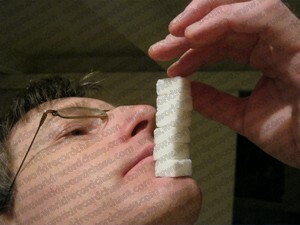 This is the story behind my Guinness World Record™ for the Most sugar cubes balanced on the chin (single stack). Sugar. We all know the stuff. We all eat it, and our bodies crave it. Some of us eat way too much of it and it rots our teeth, causes all kinds of sickness, and costs us lots of money to fix. And that’s not to mention the heartache our families suffer when we get sick from eating too much of this sweetener. But I’m not here to teach you how to eat well – other people do that better than I could. I’ll simply show you another way of using sugar which will not give you toothache, upset your blood sugar levels, or make you hyperactive. It’s called attempting a balancing world record. And the best news? You won’t have to eat the sweet-tasting granules afterwards. That’s if you can resist it, which I recommend! When I saw a world record category for balancing sugar cubes on my chin, it appealed to me. Off I went to the supermarket and bought a box of sugar cubes, while remembering how I’ve seen wild lands being burned and bulldozed flat to make way for growing sugar which will help to make some people sick. I’ve never understood why people feel good killing our world to make people suffer. But it happens. Anyway, I could hear the sugar crunching inside its box, and that told me some cubes would be losing surface area as they ground abrasively into the ones alongside. Yet, I needed them so with great care, I cradled the box in my cupped hands and made my way home on foot. Out of the corner of my eye, I saw people pointing at me, ridiculing me for carrying a box of sugar cubes this way, and staring as they drove past. Did they know; did they know how sacred these cubes of tiny granules were? No. So I forgave their jeering and kept walking. When I lifted the lid, I admired the cubes lying neatly positioned in rows. I gingerly removed the first, the second and the third. A tiny flow of loose granules trickled to the bottom of the box, making a soft whisking sound. I cringed, because each cube edge to rub off meant it would be harder to balance that cube. Ever so slowly, I removed one cube at a time, and placed them in a smaller container. I sank into my favourite chair and spread my legs to stabilise my body. You might think that’s a little extreme for balancing sugar on my chin, but remember that with each breath I took, I knew my chin would wobble just a tiny bit. That’s what happened when I tried my balancing act for the first time. I threw my head back, tensed my neck muscles and placed the first cube in the position I thought best. It stayed right there – good. The second cube was rather tricky to position because, try as I might, I simply couldn’t bend my vision so far down my face as to see my lower lip. I tried, believe me. All I got was sore eyes muscles. So I had to place the second - and arguably the most important - cube by feel alone. Doing this showed me how sensitive human fingertips really are. I seemed to be able to detect every grain of sugar, the edges of both cubes, and how far they were out of alignment. With great care, I lined up the first 2 building blocks of my sugar tower and reached for the third, while still staring at the ceiling. As I removed my fingers from my chin, having positioned the next cube, I took a slow breath and my tower toppled. I hadn’t got the second cube into the best possible position for retaining balance if the tower suffered a wobble, I was convinced. That was no worry to me, though… as a seasoned world record breaker, I knew what to do: keep trying. So I reached for the fallen cubes, inhaled deeply, breathed out and began building another tower on my chin. This went on for over an hour, until, finally, I was able to place 11 cubes on top of one another without them falling. I was literally too scared to breathe in, in case I wobbled the tower off balance! I sat there, as the rules state, waiting for a few seconds to pass – while my lungs began to expand forcefully. I resisted, which caused me to become a little dizzy. My lungs wanted to fill with air more than ever, but I kept holding my chest still until there was no way I could do that any longer. Air raced down into my chest and I immediately felt better. But the sugar had gone. Cubes hit the chair and my feet as they cruised for the carpet where they bounced to rest, some smashed and others badly chipped. Why would I care? I’d done it. Eleven cubes had been my goal and after much effort, I’d got there. My neck was really sore, but I guess that’s one of the prices a person pays for being so determined to play with their food. It serves me right, I think. As I rubbed the back of my neck, I dreamed of receiving another world record certificate. Getting the results would take some time, but I was prepared to wait… because I know it’s worth it. And sure enough, it came: I was awarded a world record for balancing 11 sugar cubes on my chin. Well done to my very own chin, I say!